The blue wildebeest (Connochaetes taurinus), also called the common wildebeest, white-bearded wildebeest or brindled gnu, is a large antelope and one of the two species of wildebeest. It is placed in the genus Connochaetes and family Bovidae and has a close taxonomic relationship with the black wildebeest. The blue wildebeest is known to have ve subspecies. This broad-shouldered antelope has a muscular, front-heavy appearance, with a distinctive robust muzzle.Young blue wildebeest are born tawny brown, and begin to take on their adult colouration at the age of two months. The adults’ hues range from a deep slate or bluish gray to light gray or even grayish-brown. Both sexes possess a pair of large curved horns. The blue wildebeest is a herbivore, feeding primarily on the short grasses. It forms herds which move about in loose aggregations, the animals being fast runners and extremely wary. The mating season begins at the end of the rainy season and a single calf is usually born after a gestational period of about eight and a half months. The calf remains with its mother for eight months, after which time it joins a juvenile herd. Blue wildebeest are found in short grass plains bordering bush-covered acacia savannas in southern and eastern Africa, thriving in areas that are neither too wet nor too arid. Each year, some East African populations of blue wildebeest take part in a long-distance migration, seemingly timed to coincide with local patterns of rainfall and grass growth. The blue wildebeest is native to Angola, Botswana, Kenya, Mozambique, South Africa, Swaziland, Tanzania, Zambia and Zimbabwe. Today it is extinct in Malawi, but has been successfully reintroduced in Namibia. The southern limit of the blue wildebeest range is the Orange River, while the western limit is bounded by Lake Victoria and Mt Kenya. 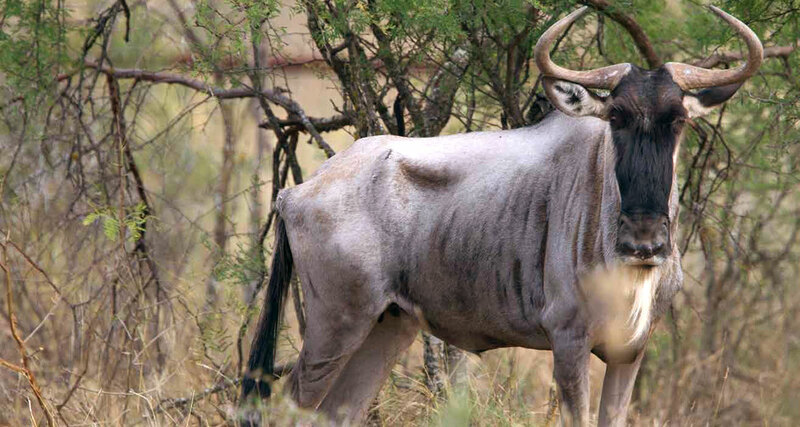 The blue wildebeest is widespread and is being introduced into private game farms, reserves and conservancies. For this reason, the International Union for Conservation of Nature and Natural Resources (IUCN) rates the blue wildebeest as being of Least Concern.The population has been estimated to be around one and a half million and the population trend is stable.